OMG Miss Brigit....Your cupcake is really cute....love your card!! Great colors, papers fab & fun ways that you have used all of Miss Emma's goodies!! Awesome coloring job and such pretty touches with your sequins and pretty ribbon. Today's Sneak Peek is a must have. Super outstanding creative job! YOU ROCK!! What a yummy looking card!!!!! What a beautiful card Brigit! FAB color combo!!!!!! Very pretty card! Looks yummy! So sweet. I like the colors and patterns. This is beautiful! I love the papers and design:) The cupcake looks fabulous! Your cupcake looks so pretty against the chevron background you made. So super adorable! I love the colors and the chevron pattern too! What a wonderful card! I love the color palate you chose. I love how your background turned out and your beautiful bow. Great design and the pretty popped up cupcake and Stitched Edge are wonderful. Great job. Such a pretty card! 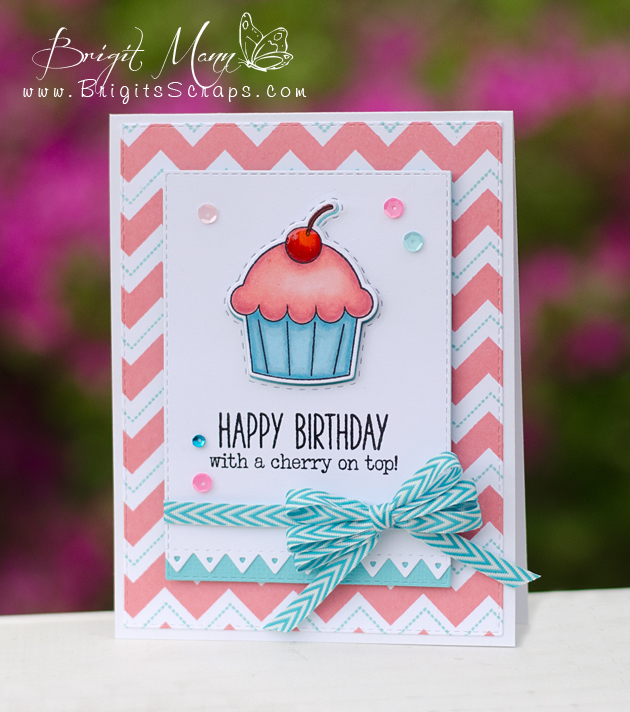 Love the colors and pattern of papers you chose for this cupcake card. This is just so adorable. I love cupcakes .. this is going on my must have list!! Thank you for sharing. Wow, that is adorable. I just love the color combination. Such a cute card, can't wait to get this set. Fantastic crazed- love the Chevy design and colors. Beautiful card, love the colors, and is that a TRIPLE bow? Wow! Thanks for sharing your beautiful card. LoVe your yummy colors. this is going to be a fattening release. The cupcake looks delicious. Very Pretty and Yummy too!! Yummy card! I love that ribbon! Awesome colors and pretty details on your sweet card! Love it! I love the colors you used on your card! Really pretty. Could this card be any more PERFECT?? I think not ! LOVE the way you did that ribbon ~ I need to learn how to do that and oh my your background ~ these colors are AWESOME! FAB job!! !